Longhi’s references to pinnacle figures of African American history raise a simple but crucial question: Whither Black European history? Where are the iconic Black historical figures of Europe to challenge contemporary European myths of homogeneity, diaspora, and belonging? Although there are currently more than eight million people of African descent living in Europe (as far as scholars can surmise since most European states refuse to track their populations according to race), Black Europeans lack constructed narratives of their own pasts that are vital for community building. Their histories and their communities are rendered invisible. 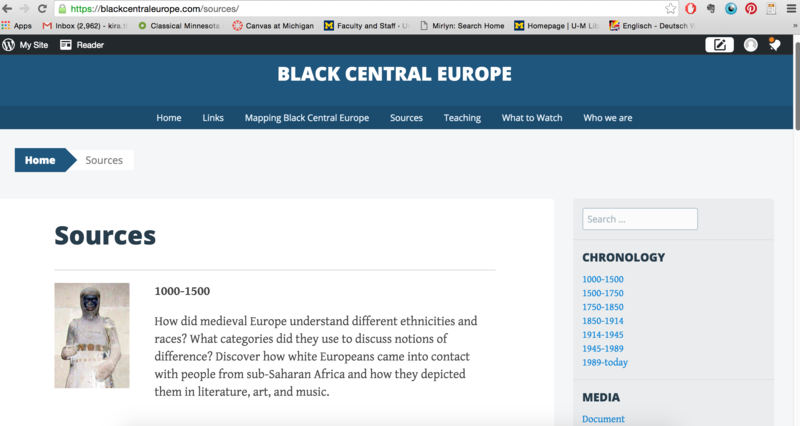 Moreover, there are few if any institutions, centers, or hubs dedicated to locating and discussing Black European history and studies. Black European histories, like the experiences of Black Europeans themselves, are stories of fragmentation, isolation, and marginalization. My colleagues at the University of New Mexico, University College London, University of Missouri, Oberlin College, and I formed a collaborative in 2014 to advance the study and history of the Black diaspora to Central Europe. We sees to integrate Black history into Central European historiographies on nationalism, cultural formation, and race to illustrate that people of African descent have always been part of Central European history, and, thus, have always been European. In doing so, our program counters the popular notion that people of African descent are a new phenomenon in Europe – and thus are historical outsiders – and instead highlights the many different cultural forms of identity-making that were available to Germans and Austrians of all backgrounds in modern history. 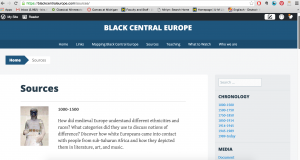 Our dedication for educating the public about Central Europe’s own Black pasts has led to the creation of a website, Black Central Europe. Our website is a repository for primary sources in English and in German on the history of Black people in Central Europe. 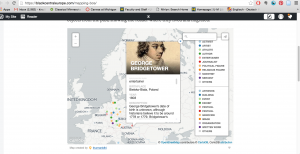 Modeled after other public history sites such as German History in Documents and Images and Interracial Intimacies our website offers links to other relevant digital humanities projects such as Swag Diplomacy or Mapping Ira Aldridge. We also share links to contemporary Afro-German social media sites and anti-racist organizations such as the Antonio Amadeu Stiftung, Initiativ Schwarze Deutsche (ISD), and Krause Locke. We also post Afro-German web series such as Schwarz Rot Gold or Polyglot on our website for the public to watch. Being teachers ourselves, we offer pedagogical resources on our website as well so that teachers at the high school and college levels may better integrate Black German history into their course offerings. We post teaching modules on our site and share primary sources in English and in German for students to use. There are two reasons why I wanted to join the GSA’s seminar on digital humanities: one, to get feedback on our website and to discuss with people with more experience than I have how to organize and present large swaths of data – texts, images, videos, etc. Second, I have a project I undertook with my students in the spring of 2016 called “Mapping Black Germany” that I’d like to get feedback on as well. 1. How does one organize a large body of primary sources from approximately 1000 AD to the present? 2. How does one present that material to the public in an accessible enough fashion? 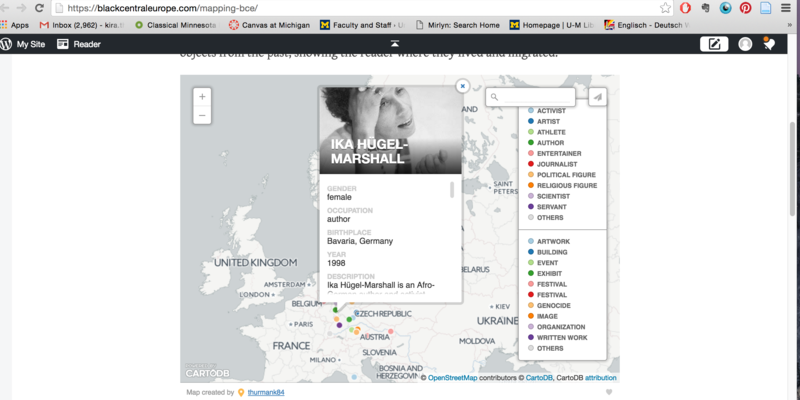 Using CartoDB, my students in my “Germany and the Black Diaspora” class created a map to highlight where Black figures, communities, and organizations have resided in Germany since the medieval era. The purpose of this project was for students to see how much Germany has participated in global developments concerning the Black Diaspora since the medieval era. 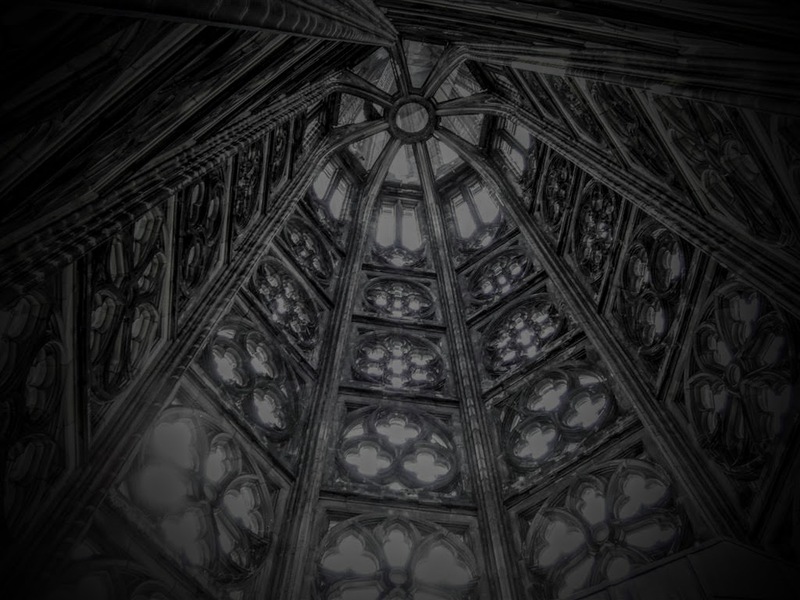 They created pins pointing to St. Gereon Cathedral in Cologne, which currently houses the relics of Gregorius Maurus, a 14th century Black mystic who gained a following after the Archbishop of Cologne discovered that Maurus regularly had religious visions, for example, and dedicated pins to contemporary Afro-German writers as well. It became apparent to my students really quickly that mapping makes the invisible visible. We had many conversations on the political and historical meaning of rendering minorities visible in spaces that have erased their history. Using the map that we created, we asked questions about what it means that our digital map of Blackness does not correspond to the mental maps of most people who study European history. In short, students will see more clearly that the politics of what gets on the map is contingent upon who is making it. 1. What do I do with this map for the long term? How do I maintain it and grow it? This map will be a permanent feature of Black Central Europe. I plan to teach my “Germany and the Black Diaspora” class every winter semester and involve students every time in building onto and shaping the map. Because this is a long-term project, I hope that each time I incorporate the map into my class, we will be able to ask different questions about map-making and Black identities in Central Europe. Over time, as more information appears on the map, I hope to be able to manipulate the data to look for patterns and flows of migration. Moreover, because this map is a permanent fixture on the Black Central Europe website, I wish to know how to use this map as a service to the public. I envision the map functioning as a public history project hosted by the University of Michigan. 2. What is the relationship between geo-spatial technologies and minority history? 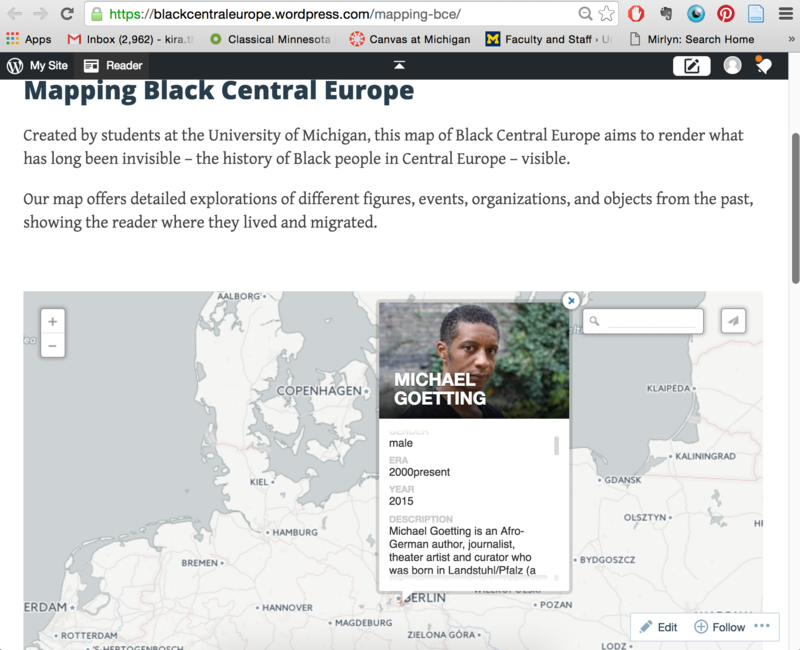 Is this the right tool for me to use to display the diverse and rich history of Black lives in Central European spaces? Can geo-spatial technologies help historians iterate the complex phenomenon of historical identity construction – or do they flatten those identities? What do I stand to gain and what do I stand to lose by placing the fourteenth century religious figure Saint Maurice and twentieth century Afro-German poet May Ayim in the same geographical space?